The little-known and smallest member of the rhinoceros family, the Sumatran rhinoceros, is critically endangered. Today between 30 and 100 are isolated on the islands of Sumatra and Borneo in Southeast Asia. 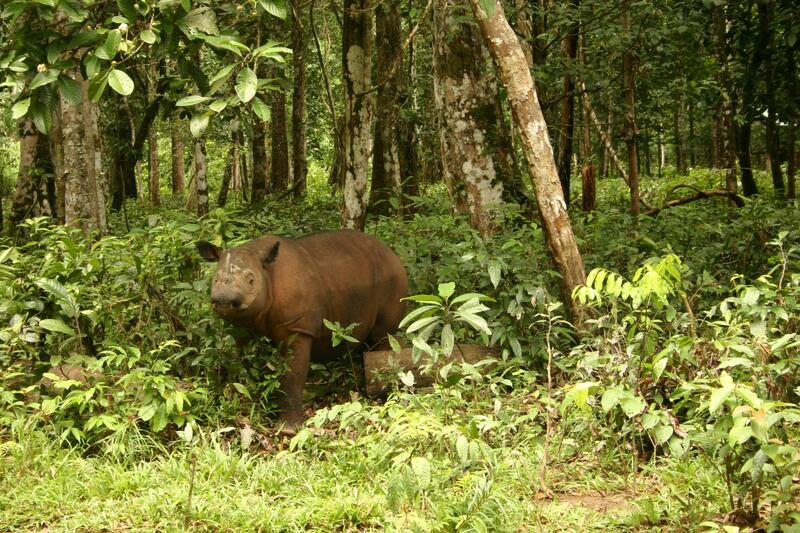 In a new study, researchers urge conservationists to translocate the two island groups–representing two subspecies of the Sumatran rhino–and to create a cell bank to preserve the genetic diversity uncovered by this work. "It is heartbreaking as a geneticist to recommend that two subspecies, which are probably as different as humans were from the Neanderthals, should be combined into a single conservation unit," said Al Roca, a professor of animal sciences in the College of Agricultural, Consumer and Environmental Sciences and the Carl R. Woese Institute for Genomic Biology at the University of Illinois. Published in the Journal of Heredity, the study analyzed 13 samples taken from zoos and the wild as well as 26 museum specimens to reveal differences in the species' mitochondrial DNA, the small proportion of the genome that is passed down only from mothers to their offspring. The study exposed 17 distinct mitochondrial haplotypes, a group of genes inherited from one parent, that can be used to trace a species' migrations and distribution across thousands of years. The mitochondrial DNA also confirmed the classification of three subspecies of Sumatran rhinos: D. s. lasiotis (likely extinct), D. s. harrissoni, and D. s. sumatrensis. In the wild, Sumatran Rhinos are solitary creatures, only coming together to breed. In such few numbers, it is increasingly difficult for them to find each other in their mountainous habitat. What's more, if they are not able to mate, females develop reproductive diseases that prevent them from successfully breeding. "My strongest recommendation is that they are brought into breeding centers as soon as possible because they aren't going to survive in the wild in such low numbers," Roca said. "A population of 10 individuals loses 5 percent of their genetic diversity each generation, which they cannot spare." "Unfortunately, at this point, we have to act quickly and risk losing unique genetic lineages in order to save a whole species," said first author Jessica Brandt, now a professor of biology at Marian University. This genetic erosion can be prevented, or slowed, by combining the remaining rhinos to create a larger population. A century of captive breeding efforts have yielded few babies, but recent successes suggest ex situ breeding facilities could help save this species from the brink of extinction–the result of poaching and habitat loss due to legal and illegal logging for desirable hardwoods. "We may one day be able to use stored cells to bring back what was once lost, reversing the effects of inbreeding, drift, and our own folly," Roca said. "Because they are at such low numbers, every single living Sumatran rhino is genetically very valuable, and preserving cells with genetic material from each surviving individual is of paramount importance." This work was made possible by the United State Fish and Wildlife Service Rhinoceros and Tiger Conservation Fund, the International Rhino Foundation, the World Wildlife Fund, the National Science and Engineering Research Council (Canada), and ACES Office of International Program. The paper "Genetic structure and diversity among historic and modern populations of the Sumatran rhinoceros (Dicerorhinus sumatrensis)" is published by the Journal of Heredity (doi.org/10.1093/jhered/esy019). Co-authors also include Peter J. Van Coeverden de Groot (Queen's University in Canada), Kelsey E. Witt (University of Illinois), Paige K. Engelbrektsson (National Museum of Natural History), Kristofer M. Helgen (University of Adelaide), Ripan S. Malhi (University of Illinois), and Oliver A. Ryder (Institute of Conservation Research, San Diego Zoo). The Carl R. Woese Institute for Genomic Biology research facility at the University of Illinois is dedicated to transformative research and technology in life sciences using team-based strategies to tackle grand societal challenges.